Who are the fastest GAA club in the county? The Coachford 5 Mile Road Race (Friday August 16th) has introduced a category for GAA clubs. Get yourself and three of your club mates to enter as a team. Your four finishing times will be combined and the fastest team overall will get the honour of being the fastest GAA club in the county and a trophy to show off to your rivals. 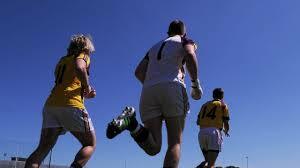 Lets put Athletics back into the Gaelic ATHLETICS Association. Register on the night from 6 pm or online at www.eventmaster.ie . This entry was posted in Useful Numbers and tagged Coachford 5 mile road race, Fastest GAA Club in the County, Running GAA Clubs, Speedy GAA. Bookmark the permalink.